When life gives you stale bread, you take that brick and turn it into breadcrumbs. Did you know that a canister of store-bought breadcrumbs contains approximately 40 different ingredients, many unpronounceable? And those sawdust particles are rarely ever made from whole grains. Compare that to just 5 or 6 ingredients found in breadcrumbs made from a loaf of your favorite local bakery or home-baked bread. Why? It's all about the shelf life - how long can that canister sit in a warehouse, 18-wheeler, grocery store, and your pantry? With those ingredients, likely through the next nuclear winter. You don't need that, though. Do you? So make your own. They won't survive nuclear winter, but they will last at least a month or more in an airtight glass jar. It's so simple and you will feel so satisfied knowing you spared a dried out loaf from the garbage chute and now have a wholesome ingredient on hand. And your friends might refer to you as Martha Stewart. Wait, don't let that be the reason you don't try this at home. Please try this at home. There are so many uses for homemade breadcrumbs. Here's just a few. Please share yours and I'll add to this list. 1. The above procedure might be a lifesaver for you. Now you can make your own gluten free bread crumbs with your favorite gluten free bread or crackers and save yourself the trouble and expense of finding rare packaged gluten free breadcrumbs. 2. There are gluten free substitutes for the uses of breadcrumbs I listed here. Stay tuned for some recipes and techniques coming soon. First up: my gluten free alteration of a family classic stuffed mushroom recipe. Preheat the oven to 300 degrees (or lower). Cut or tear the stale bread into roughly evenly-sized pieces. Spread cut bread in an even layer on a baking sheet and bake for about 20-25 minutes. 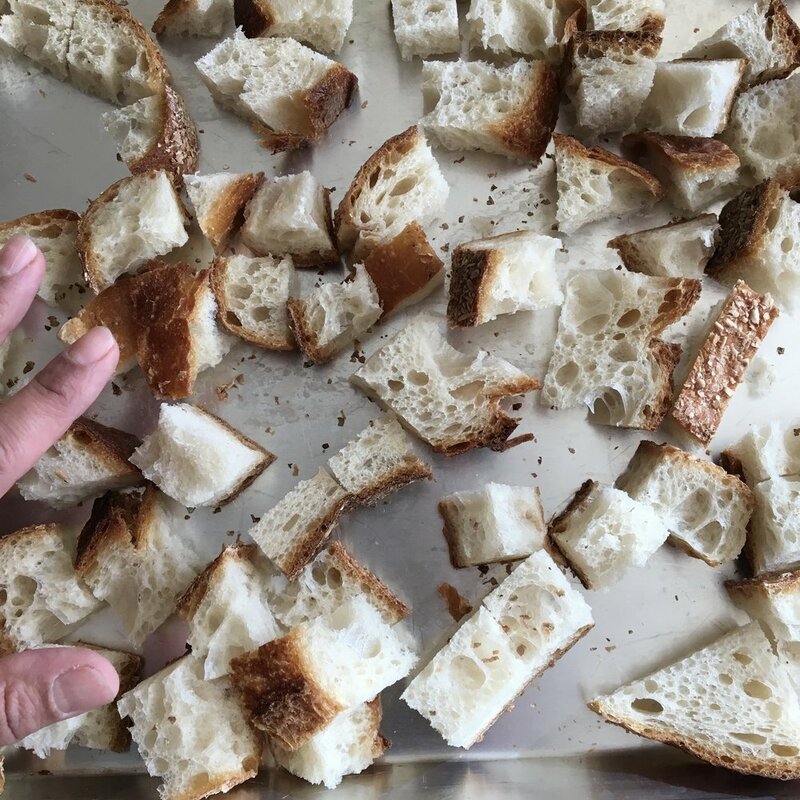 The goal is not to toast the bread but rather to dry it out, removing all of the moisture for optimal crumb consistency and to extend shelf life. Remove the bread from the oven and allow to cool completely on the baking sheet. If you try to process before all of the steam is released (listen to that crackle), you might get a gummy mess. Transfer those dry and cool bread cubes to a food processor. If it doesn't all fit comfortably, process the bread cubes in batches or add cubes as you make more room. Put on the lid, turn on the food processor and pulverize the bread cubes on high speed until evenly ground into crumbs. Stop the machine occasionally to add more bread and to check the consistency. I stop processing when my crumbs look like this. You might want yours to be smoother or more consistently ground, so in that case, keep processing. I like a mix of dust with larger crusty bits. Using a funnel, transfer the crumbs to a glass jar with a tightly fitting lid. You may recognize my kitchen funnel as a re-purposed breast shield from the Medela pump. Its wider spout makes it ideal for transferring solids into jars and, it too, was spared from the bin. Label your jar and store in your pantry for at least a month. If your crumbs are dry and crunchy and taste like bread, they're good!